International Yacht Project Management Consultants, carrying out impartial assessments of new, refit and troubled Yacht and Super Yacht Projects, providing Mentoring and using Professional Project Management Tools and Principles creating Organisational Structures and assessing Designs, Risks, Specifications, Quality, Budgets, Resources and Schedules. 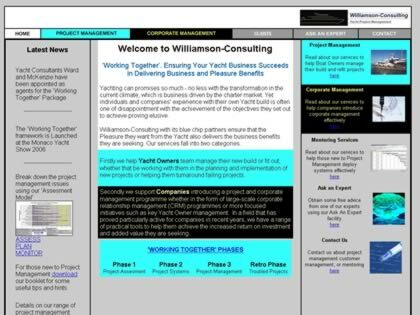 Web Site Snapshot: If available, above is a snapshot of the Williamson-Consulting Yacht Project Management Consultants web site at http://www.williamson-consulting.co.uk as it appeared when this site was added to the directory or last verified. Please Note that Boat Design Net has no involvement with the above web site; all content and images depicted in the above thumbnail are the property and copyright of Williamson-Consulting Yacht Project Management Consultants unless otherwise noted on that site. Description: International Yacht Project Management Consultants, carrying out impartial assessments of new, refit and troubled Yacht and Super Yacht Projects, providing Mentoring and using Professional Project Management Tools and Principles creating Organisational Structures and assessing Designs, Risks, Specifications, Quality, Budgets, Resources and Schedules.